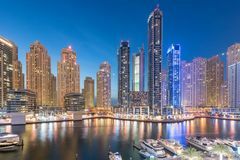 Intercontinental Dubai Marina is a wonderful 5-star hotel set within walking distance of two of the Emirates greatest golf courses; Emirate Golf Club and Jumeirah Golf & Beach Resort. The extremely lavish hotel is a modern embodiment of everything that luxury accommodation in Dubai epitomises, with elegant guest rooms and suites, state-of-the-art facilities and an enviable location, just 35 minutes from Dubai International Airport. The hotel has 328 rooms and suites which are split into three categories; Classic Rooms, Executive Rooms & Suites. Despite the gulf in price, size and ultimately the package on offer, all rooms boast a sleek contemporary design with touches of modern art used to add character. The ‘Classic’ Deluxe Rooms are the perfect example of this with subtle decor brought to life by unique furnishings and additions. The bathroom is framed by a glass wall, within which is an exclusive rain shower to wash in ultimate comfort. In the main space there is space for a 45 inch TV and large windows which afford views over the Marina. The Club Rooms or Executive Rooms are the next offering at Intercontinental Dubai Marina, providing guests with a more luxurious living space with the benefits to match. Guests staying in these rooms will also benefit from the complimentary food and drink, a private terrace on the 39th floor as well as exclusive access to the Club Intercontinental Lounge. The premier accommodation at the hotel can be found in the Suites, where the hotel’s natural grandeur is displayed. The suites feature a fully equipped kitchen area with coffee making facilities and in the separate living area is adequate and comfortable seating to make it feel like your second home. At the hotel there are an abundance of impressive dining options across a range of cuisines and varied environments. Start your day with a delicious buffet breakfast at Accents Deli with a wonderful array of breakfast meals. In the evening the main place to be is the Accents Restaurant which not only offers a wonderful A la carte menu which can be enjoyed in the sophisticated dining space or on the outside terrace enjoying magnificent views of Dubai. After dinner there are a number of places to continue your evening whether its a poolside cocktail at the Urban Lounge, a few drinks at the lively Marina Social or to Ginter for all things gin. As well as the Club Lounge and several meeting rooms, Intercontinental Dubai Marina is also home to brilliant leisure facilities too. The modern gym has plenty of space and equipment to allow guests to enjoy an uninterrupted workout while if you’re looking to relax, the hotel spa has six treatment suites accompanied by a beautiful outdoor swimming pool. Spoilt by noise into room from traffic and from the tram station outside hotel . Each time a tram came into station a bell rang 3 times and same when it left from6am to midnight. They need to sort the glass panels and glass doors to cut this noise down ! !